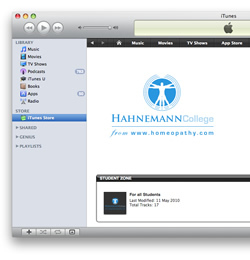 The Hahnemann College is a proud member of Apple’s iTunes U.
iTunes U — a powerful distribution system for everything from lectures to language lessons, films to labs, audiobooks to tours — is an innovative way to get educational content into the hands of students. — Source: Apple Inc. .
For login and other details, see Hahnemann College—digital content.